Never fear. It’s easy to move metadata templates from application to application. In this post, we’ll learn how to import, export and exchange metadata templates between Photo Mechanic, Adobe Lightroom, Adobe Bridge, Adobe Photoshop, and XnView. 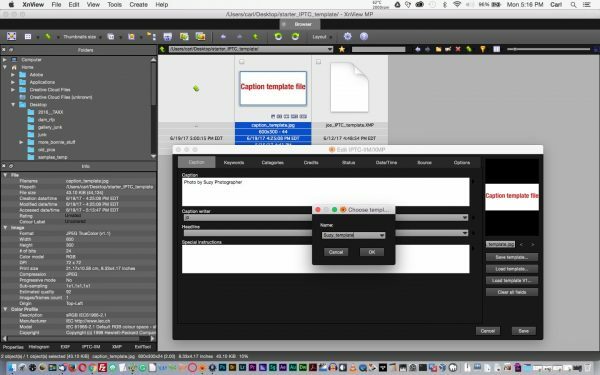 We can easily import and export metadata templates to and from our image/metadata editing applications. We can send and receive templates from clients, for example, and we can standardize templates between different applications or different computers in our own environments. 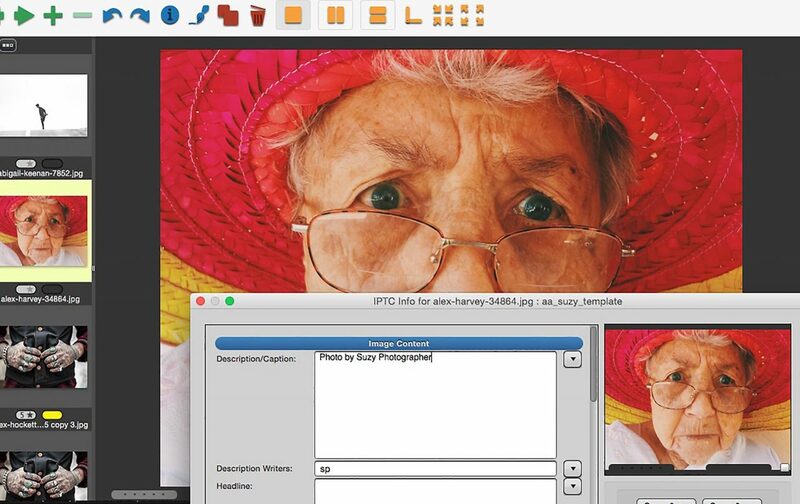 Templates save time and reduce errors on repetitive tasks like applying base metadata to images. You should always use a template. Always. Always. 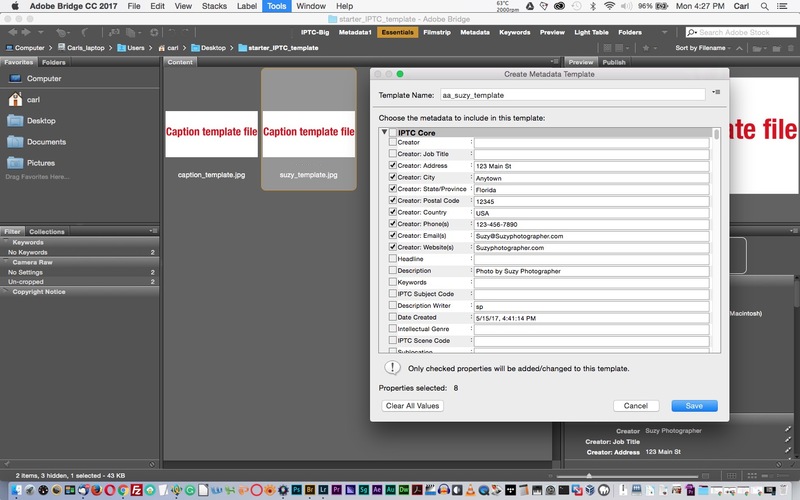 For this tutorial, you’ll need to have .XMP or JPEG metadata templates. You can use the ones from my starter kit. 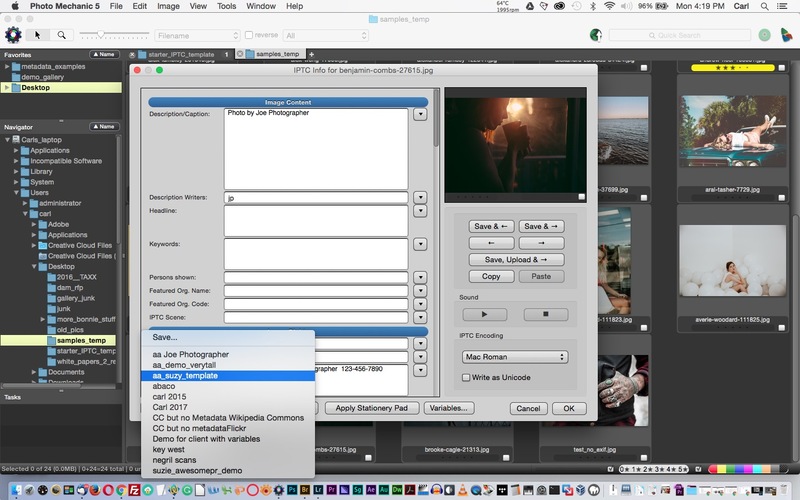 Photo Mechanic can import and export .XMP template files. We can import or export templates in either Photo Mechanic’s IPTC Stationery dialog (CMD or CTL + I) or its per-image IPTC Info metadata editor. (Just the I-key, or the ‘I’ button on a slidemount in the contact sheet view.) Templates and Snapshots are interchangeable between the two tools. For this tutorial, we’re going to use the IPTC Info editor. Find any old JPEG image in a contact sheet. One that doesn’t have any metadata you care about would be good, but any JPEG will work. Open the IPTC Info dialog. (‘I’ key, or ‘I’ button on the slidemount). Click the ‘Clear’ Button to clear the editor. Click the ‘Load…’ button and navigate to your .XMP template. Click ‘Open’ and the editor will load with the values from the template. Edit the template to suit your own needs. Click the Snapshot button (Lower left corner of the dialog. It has a lightning bolt icon) and save a Snapshot of your new template with a descriptive name. Now you’re good to go. You can call your template from the IPTC Info editor or the IPTC Stationery Pad by clicking on the Snapshot button and choosing it from the flyout list. To save your new template as a new .XMP file, simply click ‘Save…’ in either the IPTC Info or IPTC Stationery Pad dialogs and choose a filename. To save your new template as a JPEG template, choose a suitable JPEG file. (It’s probably a good idea to make an image of the words “Template File”, or something to that effect, but a bathroom mirror selfie, or whatever, will do.) 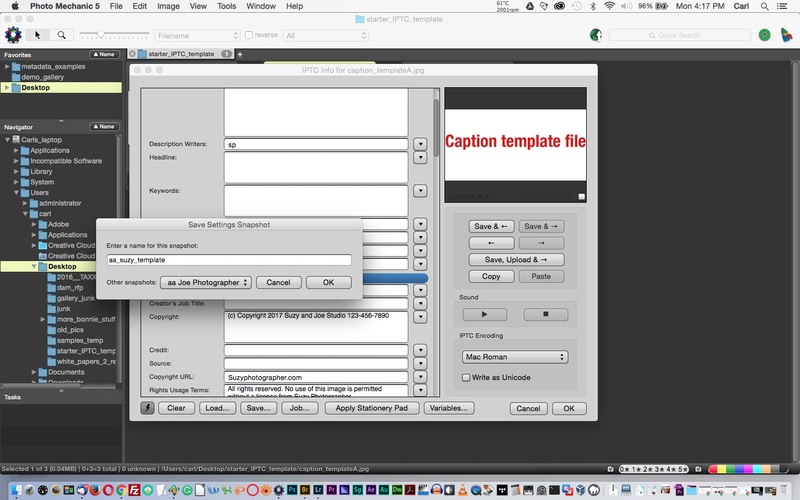 Use the IPTC Info dialog to apply your template metadata to that file. You’re done. Lightroom cannot work with .XMP files, so we’ll use a JPEG metadata template. From the Metadata panel on the right rail in Library view, click on the ‘Presets’ flyout and, from the bottom, choose ‘Edit Presets’. Or, you can choose ‘Edit Metadata Presets…’ from the ‘Metadata’ pulldown in the main menu. The Edit Presets dialog should populate with the values from your imported template. Edit to suit your needs. From the ‘Preset:’ flyout at the top of the dialog, choose ‘Save current settings as preset’ from the bottom of the list. Choose a suitable name and save. You’re done. Now your new preset (template) will be available in the ‘Presets’ flyout in the metadata panel and anywhere else in Lightroom where you might need it, like the Import dialog. To save your preset back to another JPEG file to share it with another Lightroom user or move it to another program, find or import a JPEG, and apply your template to it. With the file selected, go to the ‘Metadata’ pulldown in the main menu and choose ‘Save Metadata to File’ to write your metadata to the file. That’s it. You’re done. That file is now usable as a metadata template file. 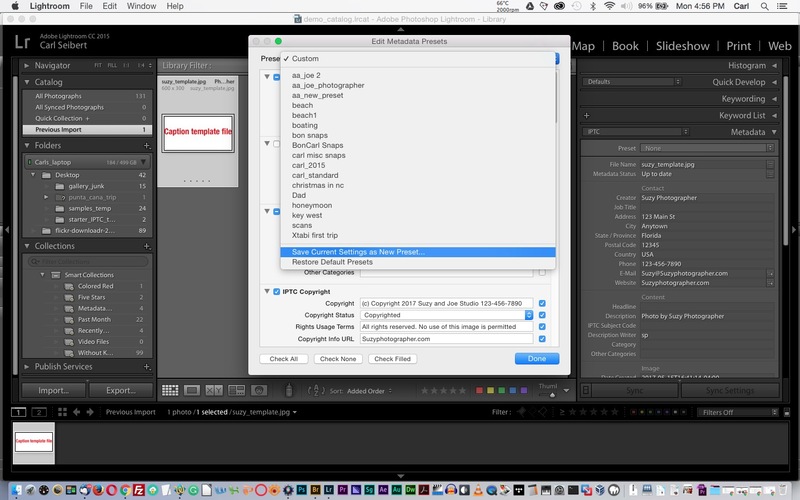 Adobe Bridge can import and export .XMP template files. If you don’t need to edit the template you are importing, you can simply drag in the template file. Select any image file in the browser, and choose ‘File Info’ from the ‘File’ pulldown on them main menu. In the File Info dialog, click on the presets flyout in the middle of the bottom of the dialog, and choose ‘Show Templates Folder’. An operating system file manager window showing your templates folder will open. 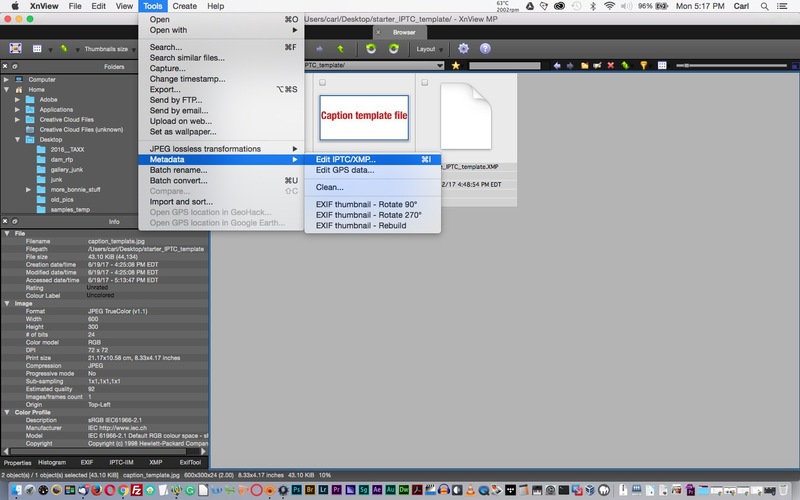 Drag your .XMP template file into the folder. You’re done. The template will now appear in the ‘Append Metadata’ or ‘Replace Metadata’ submenus under the ‘Tools’ main menu pulldown, or in the Edit Presets dialog. If you do need to edit your template, click ‘Import’ instead of ‘Show Templates Folder’ from the File Info dialog. Choose ‘Clear existing properties…’ from the ensuing dialog. 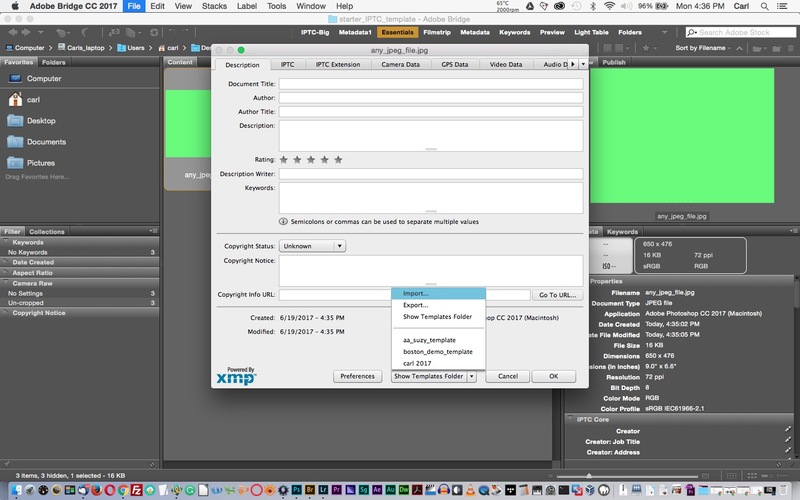 Navigate to your .XMP template file, select it and click ‘Load’. The File Info dialog will be populated with your template values. Edit them to suit. When you’re satisfied with your edits, choose ‘Export’ from the Presets flyout, and save your new .XMP template file. If you are working with a JPEG template file (from Lightroom, for example), select your template JPEG file in the browser and go to the ‘Tools’ pulldown in the main menu and choose ‘Create Metadata Template’. The Create Metadata Template editor appears, with values from your template filled in. Edit to suit your needs. On the left side of the Create Metadata Template dialog, there are tickboxes, on for each field. Tick the tickboxes for every field that you want to be active in your template. Usually, that will be all of them that have values filled in except ‘Date Created’, which varies from picture to picture and is thus useless in a template. Fill in a name for your template, click ‘Save’ and you’re done. To save a new JPEG template file, make a JPEG file as described in the Photo Mechanic section above, and apply your template to it. Photoshop won’t likely be your go-to metadata authoring application, but it’s handy to have your templates available in Photoshop. 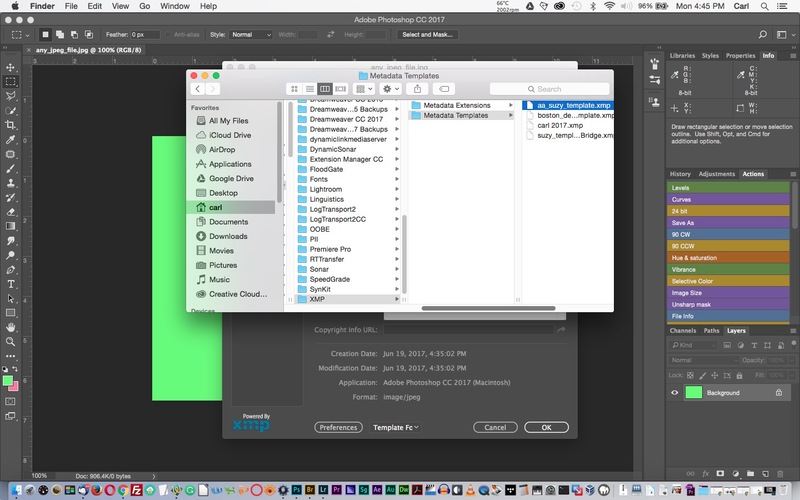 In Photoshop, open or use CMD/CTL+N to create an image file. From the ‘File’ Pulldown on the main menu, choose ‘File Info’. The File Info dialog in Photoshop looks different from the Bridge version, but for templates purposes, it works the same way. Follow the instructions for importing and exporting .XMP template files in the Bridge section above. To export a JPEG template file, simply make a new document with CMD/CTL+N, decorate it to taste, apply your metadata template information to it, and save it as a JPEG. Metadata aside, everybody should have a copy in XnView because it does a great job of opening mysterious or damaged image files. It can handle over 500 file types. XnView is free for personal use and costs only about €30 for commercial use. XnView is free for personal use and costs only about €30 for commercial use. Open the folder containing your JPEG template file in the XnView browser and select the file. The IPTC editor will open filled with the values from your template, displayed in various tabs. Edit your template values to suit. Click the ‘Save template…’ button on the right side of the dialog. A ‘Choose Template’ dialog appears, with the space for a name highlighted. Simply type a name for your template in the space provided, and click ‘OK’. You can call your template with the ‘Load template’ button right under the one you used to save it. To make a JPEG template file, in XnView, the procedure is the same as it is in Bridge. Make a JPEG, apply your template to it and that’s it. Note that you can overwrite the name of a template in the choose template dialog. That’s a little bit dangerous, but it can also be very handy if you want to make a temporary template and change its values repeatedly. In this way, you can more or less replicate the functionality of the ‘IPTC Snapshot’ function in Photo Mechanic, or the ‘Sync’ function in Lightroom. I mentioned that XnView can work with IPTC metadata “with some limitations”. Here’s the rub: XnView can only write core IPTC metadata. It can’t write any of the extended IPTC fields that are stored only in the XMP data. That includes the contact fields, right fields, and Rights/Usage Information. That’s not as bad a handicap as it might seem because legacy applications can’t read the extended fields anyway. That’s not as bad a handicap as it might seem because legacy applications can’t read the extended fields anyway. XnView DOES write a copy of the core IPTC metadata in the XMP data, as expected by modern programs. And it can read the extended fields. A file written by XnView should be compatible with future programs that might not be able to read the old IPTC/IIM data, and you shouldn’t have to worry about it making files where the two instances of the IPTC data are out of sync. Comments? Questions? Requests? Comment below. Look for How-Tos on working with metadata in Bridge, XnView , and Photoshop right here in the coming weeks.